Cédric Angot (FRA) and Talent des Moitiers took a stunning opening win of the Longines Global Champions Tour of Chantilly, flying the French flag to kick start three days of spectacular show jumping. A smiling Cédric said: “I’m very happy, my horse jumped very well. I think for tomorrow’s [Longines Global Champions Tour Grand Prix of Chantilly] he will be good!" 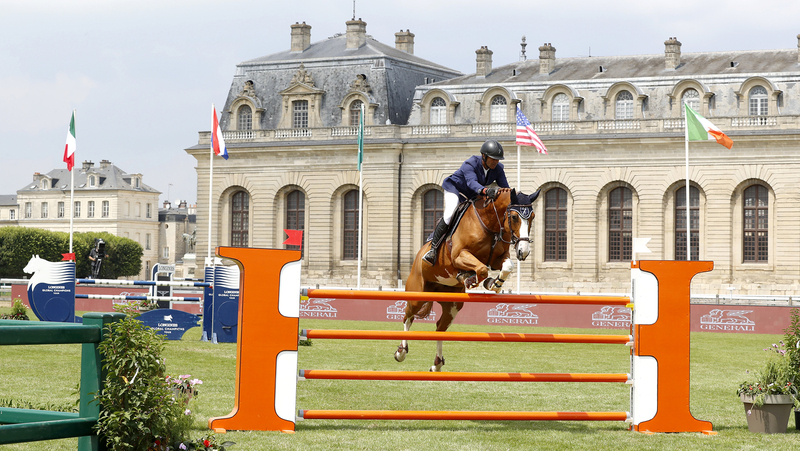 Set against the exquisite backdrop of the Chateau de Chantilly’s Grandes Écuries, an international field of 61 horse and rider combinations took to the galloping grass arena for the first time this weekend. Just 50 miles north of Paris, the beautiful show ground is set within the Chantilly racetrack with today the first day of competition on the 11th leg of the LGCT season. First to go Alexandra Thornton (GBR) carved a galloping path around the huge grass arena, taking on Uliano Vezzani’s track and jumping beautifully with Charielle to kick off the competition in style with a time to beat of 65.07s. French fans were thrilled after Philippe Rozier (FRA) blazed around the course, knocking two seconds off the time with Cristallo A LM to set the new time to beat at 62.93s - daring the rest of the world class field yet to come. Young talent Jennifer Gates, who has started a training partnership with World Number 1 Harrie Smoldes (NED), put in a brilliant performance with Dolinn, slipping in just ahead of Thornton to sit in provisional second with a time of 64.93s. Further clears came from Yuri Mansur (BRA) with Vitiki, Edwina Tops-Alexander (AUS) on new mount the 9 year old Casquell, Rene Lopez (COL) with Histoire D O, Christian Kukuk (GER) with Lukas, Lauren Hough (USA) with Papa Roach, Luciana Diniz (POR) with Lennox, Martin Fuchs (SUI) with Clooney, Luiz Felipe de Azevedo Filho (BRA) with Chaccomo and Hermes van de Vrombautshoeve, John Whitaker (GBR) with Argento, Scott Brash (GBR) with Hello Jefferson, Laura Kraut (USA) with Whitney, Niels Bruynseels (BEL) with Israel v/d Dennehoeve, Marcus Ehning (GER) with Cornado NRW, Philip Houston (GER) with Chalanda, Marc Dilasser (FRA) with Utah van de Rock, Michael Duffy (IRL) with Egalini, Ben Maher (GBR) with Explosion W, Jessica Springsteen (USA) with RMF Tinkerbell, Christian Ahlmann (GER) with Take A Chance on me Z, Jerome Guery (BEL) with Hercules by Immofluisteraar and Penelope Leprevost (FRA) with Vancouver de Lanlore. A brilliant round from Denis Lynch (IRL) and RMF Fairview pushed El Dahan off the top spot, six hundredths of a second faster, with the timings creeping ever closer to the sub 60s mark. With a new time of 60.98s to beat, the pressure was on the remaining competitors. Marlon Módolo Zanotelli (BRA) broke the sub 60s barrier, pulling out a blazingly quick round on the 9 year old VDL Edgar M - the chestnut gelding responding beautifully to the Brazilian’s requests to stop the clock in 58.53s. Their time looked unbeatable, but the French proved to be on flying form on their home ground with Cédric Angot (FRA) and Talent des Moitiers clinching the lead with a new time to beat of 58.31s. Despite a few valiant efforts, the pair retained their lead to the end of the class, taking the first win of the weekend much to the delight of the local French fans. The next class, the GCL Chantilly Round 1, kicks off at 16:15 local time - tune in via GC TV and on the official GCL Facebook Page.